Description: The tiny flowers are in lacy, flat-topped umbels. 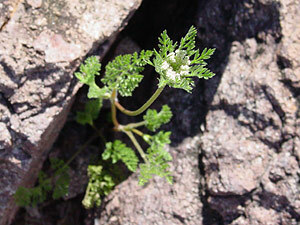 As they age, the flower umbels fold up into cups and then dry to a brownish color. The individual flowers are uniformly white and have 5 petals. 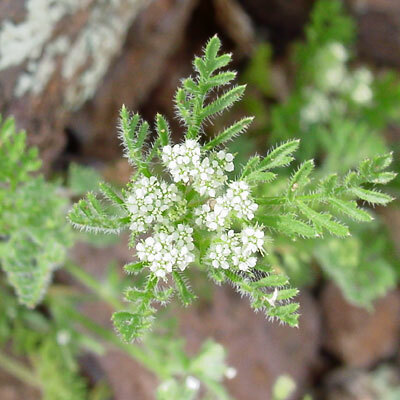 The leaves are pinnately dissected with linear leaf segments, are often densely covered in bristly hairs, and when crushed, smell like carrot leaves. The stems are slender and usually unbranched. The plants have an enlarged taproot. Edible – The roots are edible either raw or cooked.